A skier has been killed in the Cosmiques couloir today around 11h00. The man, who lived in the Grenoble area, lost his grip on ice and fell 500 meters. The couloir had a goulotte (ice band) in the middle. The couloir is reached on the west (Bossons) side of the Aiguille du Midi. It often requires roping up to reach the skiing. 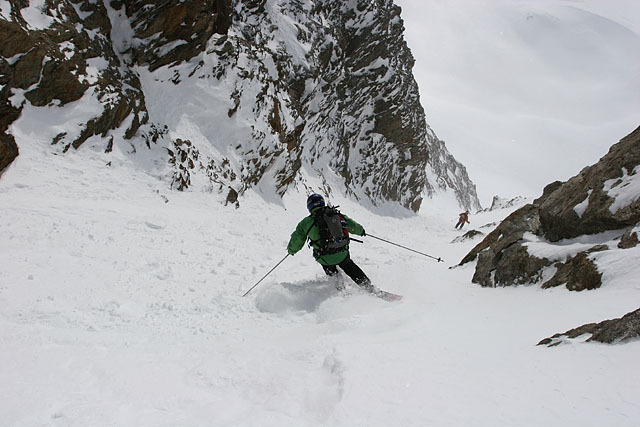 News of the accident has shaken members of the elite ski mountaineering fraternity in Grenoble who knew the victim well. There are some moving and eloquent passages written on the Skipass site. Obviously a highly talented and highly respected young skier. My condolences and heartfelt sympathy to all who knew and were close to him.